(Nanowerk News) IMEC presents an improved processing technique for germanium-based thermophotovoltaic (TPV) cells resulting in significant reduction of cell cost, an essential step to develop a market for thermophotovoltaic applications. Imec's newly developed TPV cells are fabricated on germanium substrates with an optimized surface, specifically designed and manufactured for this application. Thermophotovoltaic cells convert radiation from heat sources with a temperature lower than the sun's temperature. TPV cells are ideally suited to be used in an industrial context, for example to generate electricity from waste heat released during steel or glass production. Alternatively, TPV cells can be added to domestic heating systems to co-generate electricity besides hot water. TPV cells may therefore reduce the waste and hence increase the efficiency of domestic heating systems. However, due to the overall complexity of a full TPV system and the relatively high cost of existing suitable cells, TPV systems are yet to find entrance to industrial and consumer applications. Imec's newly developed fabrication process is an important first step in opening up the market potential for this very promising technology. 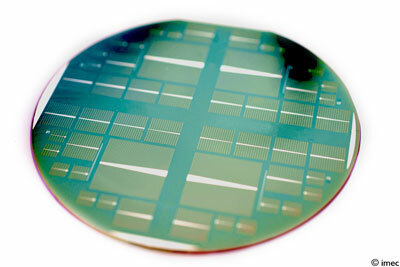 Imec's germanium-based thermophotovoltaic cell with an optimized front and rear surface finishing. The emission peak of selective emitters typically used in TPV systems is close to the bandgap of germanium. Therefore, germanium photovoltaic devices are well suited as receivers for this type of systems. Germanium-based TPV cells were up to now fabricated on epi-ready substrates marketed for the epitaxial growth of III-V layers. However, Imec's processing method does not involve any epitaxial deposition steps, as the emitter is formed by diffusion and passivation obtained by using amorphous Si. During a research program, specifically designed Ge substrates for this application were manufactured and tested. Spectral response measurements comparing the traditional TPV cells starting from epi-ready substrates with TPV cells defined on specifically engineered Ge substrates show that the latter have a remarkably better quantum efficiency. This directly translates into a higher waste heat to electricity conversion efficiency. Jef Poortmans, Director Photovoltaics at imec: "Imec's research into photovoltaics aims at finding techniques to fabricate cost efficient and more efficient solar cells. We have built up a strong expertise in silicon solar cells of more than 25 years. We successfully used this knowledge for our TPV research. We applied imec's proprietary surface passivation techniques, novel contacting technologies and material knowledge to improve the quantum efficiency of our TPV cells, resulting in higher cell performance and cost reduction." Imec is headquartered in Leuven, Belgium, and has offices in Belgium, the Netherlands, Taiwan, US, China and Japan. Its staff of more than 1,750 people includes over 550 industrial residents and guest researchers. In 2009, imec's revenue was 275 million euro.